I have one of these, ordered from their Kickstarter campaign. It definitely works, but the thing itself does get warm (and so warms up phone and watch) when charging. I used mine for a few days, then stopped and went back to the things I was using before (a cheap Qi charging stand from Amazon for my Xs, and the little rubber old style Mac holder for my AW). I bought the Unravel primarily for travel. I have no regrets buying it or qualms about using it, but it’s not flawless. I have the Anker Powerwave+ which can quick charge an iPhone XS and an Apple Watch at the same time. Although it requires the 1.5m Apple Watch charger which wraps the cord about inside and plugs into a USB-A port internally. It connects via USB micro and not USB-C to the Anker AC power transformer. But it only takes one outlet. The only thing missing is you can’t charge the AirPods at the same time. But I guess I could drop them on the Qi charger whilst shaving and having my coffee in the morning. I have no use for the AirPods. I would rather wear the Bose QC 35 II headphones for quiet immersion. Again, USB micro, ugh. But brilliant none the less and they do Siri. Battery life last many times longer. I always feared dropping an AirPod in a sewer grate or something. I picked up a Logitech charger the last time that I was at an Apple store. https://www.apple.com/shop/product/HM6U2VC/A/logitech-powered-wireless-charging-stand?fnode=97 I have been pleased with the power output, ease of alignment and non-annoying status LED. iFixit has a nice article on the technical challenges Apple faced. It suggests that Apple’s engineers could make AirPower functional, but not within the regulations that cover power (and thus heat) output and electromagnetic interference, which they might not have been thinking about until it was late in the process. No, this is an entirely different situation. Apple promised a hardware product and proved unable to engineer it to both work and meet necessary regulations. There’s no connection with software products or Internet services that the company canceled for a variety of different reasons. More like the new MBP KB. Despite all Apple’s (re-)engineering efforts, a spec of dust can still result in a several hundred $$$ repair. I know that for at least a couple of years, Corian has been offering a countdown material that can include a built-in charging area for multiple devices. At least this has been available in the UK and Europe. I wonder what technology they are using? I always thought it was a brilliant idea. I bought the Anker fast wireless charger for my XR and paid £12 in the UK. It works well - I only have the XR capable of charging this way at the moment but AirPods should be with me soon. Why didn’t, or don’t, they kill the butterfly keyboard? Everyone I know that has one hates it. Why do folks hate it? I don’t have one, but from what I’ve read it sounds like it has a nice tactile “click” feel, which I’d love. Way back in the old days when we got our first dumb terminals at work, they came with an IBM keyboard that is to this day the best keyboard I’ve ever used, partly because of the great feedback provided by the “click” feel. Why do folks hate it? I don’t have one, but from what I’ve read it sounds like it has a nice tactile “click” feel, which I’d love. It had a very high failure rate, which often causes missed keystrokes or multiple keystrokes when a key was pressed once, and the design is such that a replacement or repair is expensive and difficult. People can be without their MacBook for days while repairs are done, and if the damage is not covered under warranty, the repair is around $700. I’ve heard various things: that they hate the travel between keys, the pressure on different keys sometimes varies, which slows down their typing. 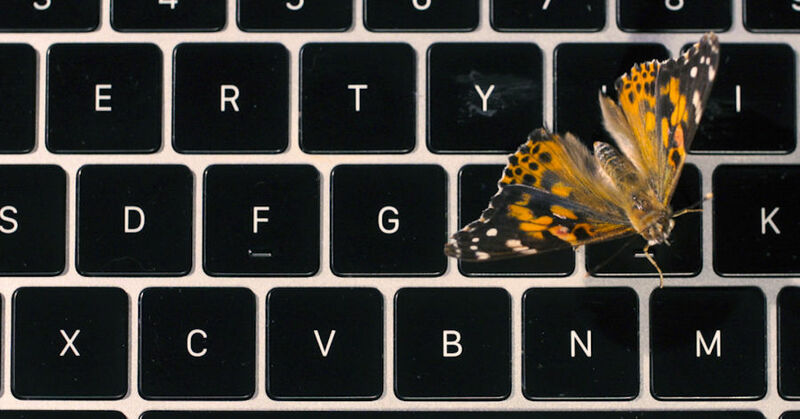 I’ve also heard the noise is too annoyingly “clakety clackety clack clack.” They love MacBook, but hate the butterfly keys. Some of the people who do with Photoshop and Illustrator suite work like the touchbar, but nobody else I know does. I’ve been using MacBooks and MacBook Pros for decades, but now that I don’t have to schlep one around to see clients so much any more, I’m thinking of getting a Mini. I don’t need the touchbar and I don’t think I’ll like the butterfly keys.